Kills microorganisms on soft surfaces, hard surfaces and more. Kills 99.9% of bacterial on soft surfaces in just 30 seconds. Kills 24 microorganisms on hard surfaces in five minutes. Eliminates odors from the air instantly while leaving a fresh citrus scent. 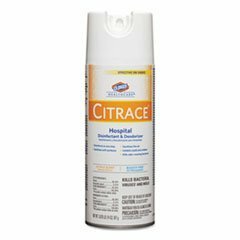 Application: Disinfectant/Sanitizer; Applicable Material: Ceramic; Cement; Fiberglass; Glass; Grout; Laminates; Metal; Plastic; Vinyl; Dirt Types: Bacteria; Fungus; Germs; Mildew; Mold; Viruses; Scent: Citrus.